REPORT FROM THE U.S.—Hoteliers who’ve recently downsized or altogether eliminated roomservice at their properties are seeing considerable labor cost savings from the shift, as well as robust profits when implementing grab-and-go dining options. Experts said all but the most luxurious hotels will likely make the move in the near future. Roomservice revenue is on the decline—down 3.6% over a trailing 12 month period, according to June 2017 data from Hotel News Now’s parent company STR—while other segments of hotel F&B operations are experiencing modest growth—up 1.5% overall for the same period. Sources explained that in addition to less roomservice being offered, the decline reflects a broader trend of guests simply looking elsewhere, often for quicker, cheaper and more unique options. Sensing the writing on the wall, a number of full-service hotels in recent years have cut back or eliminated roomservice completely. This includes the 2,000-room New York Hilton Midtown, which switched from roomservice to grab-and-go in 2013. Others seeking to still cover all the bases have modified and/or streamlined roomservice, offering alternatives like pared-down menus and takeout-style delivery in paper bags, rather than serving in-room meals with fine china and cloth napkins. Even in its infancy, the grab-and-go trend is proving especially profitable, both in cost savings and increased revenues. It’s not just the added sales from grab-and-go that are boosting F&B profits; the reduction in labor resulting from a partial or complete roomservice reduction can have a huge impact as well. That’s particularly welcome among hoteliers, since limiting F&B labor costs is becoming increasingly difficult as minimum wages rise, especially in union hotels, where job-sharing is often banned. Non-union hotels might have some success cutting costs by doing things like having their call center take roomservice calls and utilizing restaurant staff for deliveries, but in the end, it may still be better to just let go. Understandably, some operators are hesitant to completely cut the roomservice cord and are hedging their bets with both in-room and grab-and-go choices. But even in hotels that are still offering some level of roomservice, putting greater emphasis on alternatives like grab-and-go is having a positive effect on staffing, provided F&B operations are tailored for maximum effectiveness. Sources said there still is a time and place for roomservice, particularly during breakfast hours, when many guests continue to find convenience through in-room dining, as well as among guests on their first night at the property, especially after just flying into town. So for upper-upscale and luxury hotels that still want cater to this demand, smart menu engineering and labor streamlining could provide the answer rather than cutting roomservice completely. 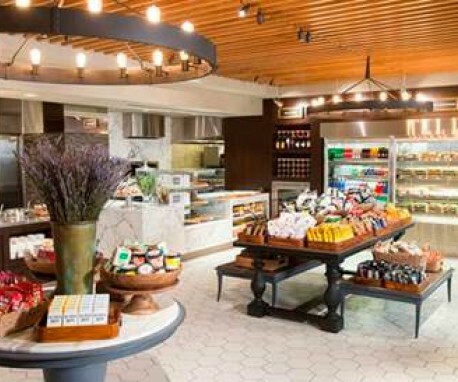 Both Green and Isenberg said that it’s likely the grab-and-go/minimized roomservice trend will morph into a hybrid concept, where fresh menu options sold in the hotel market pantry will be available for delivery to guestrooms. Mobile and online ordering can be integrated for even greater ease and marketing potential, such as on splash pages shown when guests sign in to the hotel’s Wi-Fi. It’s the kind of easy-order/rapid-delivery offering that’s made delivery services like GrubHub and UberEats rising staples for travelers, and hotels are now working to keep that revenue from being spent on those types of outside vendors.